Bats – Wired for Sound? 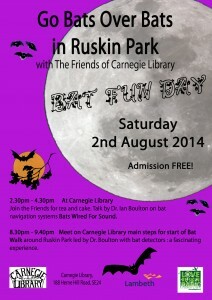 Our fourth annual Bat Fun Day will be Saturday 2 August from 2pm onwards. Coinciding with our monthly tea stall and gardening afternoon, the free event should appeal to all ages. A special feature will be a talk by Dr Iain Boulton, Lambeth’s Parks Project Officer (Communities & Education), “Bats – Wired for Sound?” It will cover life in sound and three dimensions: bats, people, sound and echolocation - how bats hear, navigate and find food; how do we compare to bats and birds (and pets) in how we hear, see and navigate? The talk will be augmented by fun, practical activities to show how we hear, navigate, and find food, and compare it with bats. Dr Boulton is seeking Bat Conservation Trust help with some practical games for a fun afternoon and will track down sound meters, sonograms and games involving sound and vision. 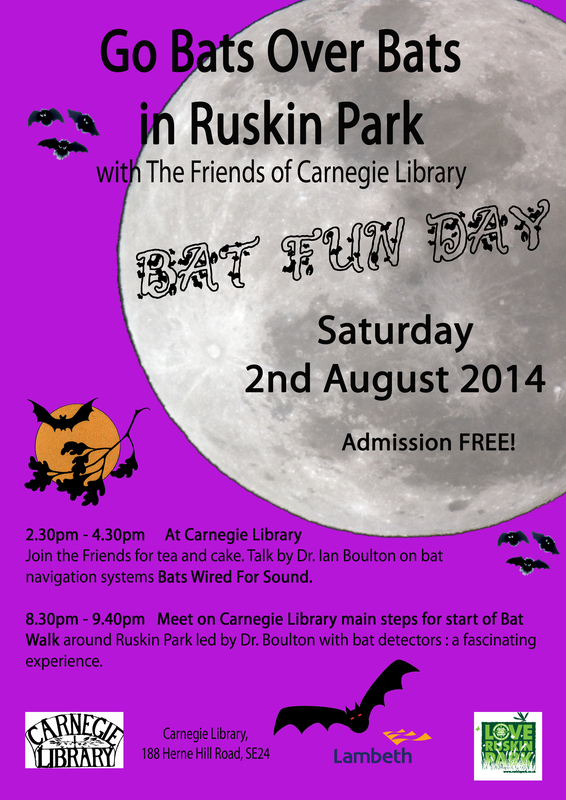 As in previous years, there will be an evening Bat Walk in Ruskin Park. Meet in front of the library at 8.30pm for an introduction talk; we then cross over to the Ferndene Road gate for a stroll up to the ponds. Bat detectors will be on hand; and it is always exciting when they start to click, indicating the bats are out for their tasty insect supper. See how many you can count!